Food Costs > How Much Do Mussels Cost? How Much Do Mussels Cost? Mussels are a type of clam, usually long and wedge shaped, which grow in the ocean, along the shoreline. On average, be prepared to pay anywhere from $3 to as much as $6 per pound for fresh mussels. The costs will fluctuate depending on the time of year and where they are purchased from. At the time of this writing, top sellers on Amazon.com were selling four-pound bags of mussels for about $50. Whole Foods, for example, sells mussels for $5 per two pounds. Wegmans, another popular grocery store chain, sells a two-pound bag for $6. At our local Costco store, the costs were closer to $13.50 per pound. As for frozen bags, the prices can be a pinch less, about $5 per two-pound bag. For example, Walmart sells a two-pound bag of fully cooked mussels from a farm for about $5. Most retailers are going to either sell them by the pound or package them into one or two-pound bag. If purchasing online, a reputable retailer will often package 10 to 20 percent more than the said weight since some can go bad during the shipping process. In a pound, expect about 20 to 25 mussels, which can feed two to three people, on average. Mussels can either be purchased frozen or fresh in the seafood department of any grocery store. They can also be ordered online or via a local fish market. If purchased frozen, they will already be cleaned, cooked and vacuum sealed. All you will need to do is open it, boil it for up to 10 minutes and serve with any sauce/ingredients. Mussels can be harvested straight from the ocean or can be grown at local farms for commercial use. If ordering online, additional shipping fees may apply. Due to the sensitivity of the order, most orders will have to arrive on your doorstep within a few days. Most shipping fees should be no more than $10, but it can be waived if you meet a certain spending requirement. Don’t forget the herbs and spices you want to use with your recipe. If you buy mussels, cook them on the same day because they expire very quickly. Buy mussels with tightly closed shells. This means that they are fresh. If fresh, mussels should smell like salt water. Before cooking, clean the mussels with fresh water. Remove any barnacles or weeds that are stuck on the shells. Soaking the mussels in fresh water will kill them, so it’s best to avoid this to keep them as fresh as possible. Look for chipped or cracked shells or any opened mussels. Separate them from the others and throw them out. These are signs that the mussels are not fresh or safe to eat anymore. Scrub off any beard found on a mussel. Usually, the beards are already removed upon purchase, but if this is not the case, remove it by grabbing and pulling it firmly. If this does not work out, you can use a knife or a scissor to cut the beard. Do not overcook the mussels because they will become tough and they will shrink. It will only take a few minutes to cook them. Although there are many benefits of eating mussels, there are also a few risks. Mussels have a high risk of carrying bacteria that is common among seafood and should be cooked immediately or purchased pre-cooked and frozen. 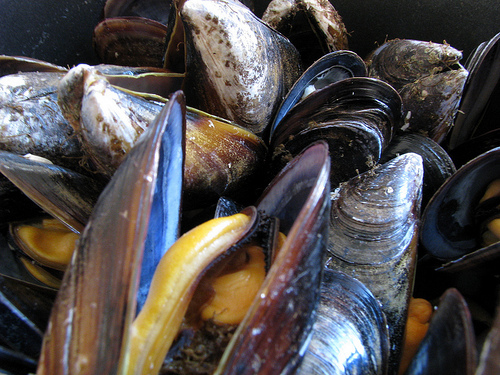 Mussels may also contain dangerous algae in their tissues. Even cooking the mussels in extreme temperatures will not kill these algae. Luckily, government agencies closely regulate this and will not allow any exposed mussels to be sold. Mussels have a limited shelf life, and it is highly recommended that they are consumed within 24 to 48 hours. If you plan to cook the mussels after a few days, store them in the fridge. Make sure to keep them damp by wrapping either wet newspaper or damp cloth around them. This will make the mussels last a lot longer, usually up to a week. If frozen, they can last up to four months as long as stored properly. Like many other types of meat and seafood, mussels are very high in protein. However, they are also very low in fat; this makes them even healthier than meats such as beef. 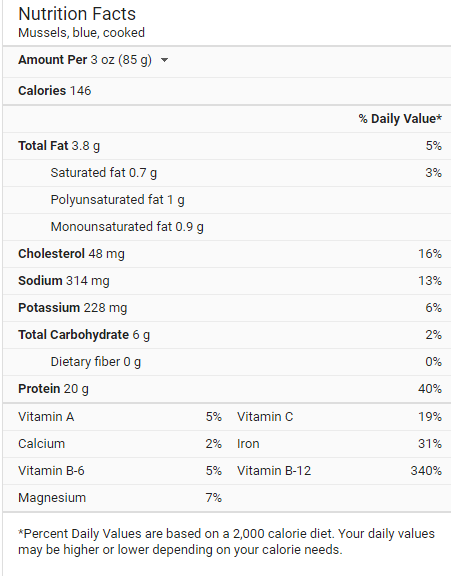 Mussels are very low in calories, only containing about 70 calories per 3 ounces. Mussels contain a high amount of vitamin B12, which can boost the metabolism of the body. A deficiency of B12 can cause depression or fatigue, so mussels can help you avoid these conditions. Mussels are also a good source of selenium, vitamins C and B, iron, phosphorous, manganese, and zinc. Cook the mussels the same day you bought it to maximize the freshness. If purchasing from a local grocery store, keep your eyes peeled for sales or promotions.